Britain's love of the underdog triumphed Sunday as intimate war drama "The Hurt Locker" beat 3D spectacular "Avatar" to take six prizes, including best picture, at the British Academy Film Awards. Kathryn Bigelow won the best-director battle with "Avatar'''s James Cameron, her ex-husband, for her intense depiction of a bomb-disposal squad in Iraq. "It means so much that this film seems to be touching people's hearts and minds," Bigelow said. Both films had eight nominations for the British awards, considered an indicator of possible success at the Academy Awards in Los Angeles next month. "Avatar" and "The Hurt Locker" each has nine Oscar nominations. 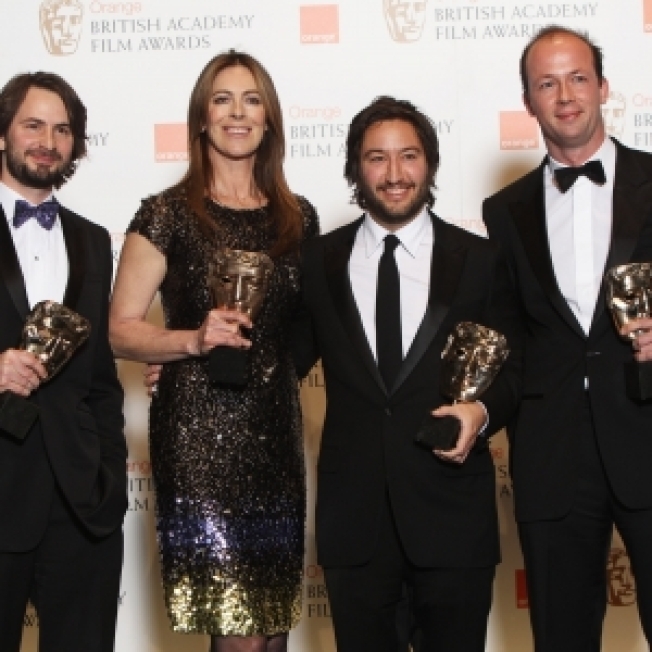 "The Hurt Locker" also took British prizes fororiginal screenplay cinematography, editing and sound. "Avatar" won awards for production design and visual effects for its vivid vision of a distant moon populated by a blue-skinned species called the Na'vi. "Hurt Locker" screenwriter Mark Boal dedicated the best-film prize to the hope of peace "and bringing the boys and girls back home." Bigelow also paid tribute to soldiers serving in Iraq, and said the goal of the film was "putting a bit of a spotlight on a very, very difficult situation." "I hope that in some small way this film can begin a debate … and bring closure to this conflict," she said. The "Avatar"/''Hurt Locker" battle initially seemed like a David-and-Goliath story. Cameron's last feature, "Titanic," won 11 Oscars, including picture and director. "Avatar" is a global phenomenon that has taken more than $2 billion at the box office. "Hurt Locker" has made about a hundredth that much. "It did not seem like a slam-dunk commercial proposition," said Boal, who thanked Bigelow and the cast for making "an unpopular story about an unpopular war." Homegrown British talent did not go home empty-handed. Rising star Carey Mulligan was named best actress for playing a precocious teenager in 1960s London in "An Education." Colin Firth was named best actor for his performance as a bereaved Englishman in California in Tom Ford's "A Single Man." Firth said he almost declined the award-winning role, which has also earned him an Oscar nomination. He said he had been about to turn it down by e-mail "when someone came to repair my fridge." He never sent the e-mail. "I would like to thank the fridge guy," Firth said. Firth said he had emerged from working with fashion designer-turned-director Ford "better groomed, more fragrant and more nominated than one has ever been before." Austrian actor Christoph Waltz, already a hot Oscar favorite, won the supporting actor prize for his turn as a chilling, charming Nazi colonel in "Inglourious Basterds." The supporting actress award went to Mo'nique for "Precious: Based on the Novel 'Push' by Sapphire." Director Duncan Jones took the award for best British debut for his lost-in-space drama "Moon." A tearful Jones, whose father is musician David Bowie, said it had taken him a long time to figure out what he wanted to do with his life. "Finally, I think I've found what I love doing," he said. Earlier, Kate Winslet, Audrey Tautou, Quentin Tarantino, Vanessa Redgrave and "Twilight" stars Robert Pattinson and Kristen Stewart all walked the red carpet before the ceremony at London's Royal Opera House, with Prince William on hand to add real royalty to showbiz aristocracy. Mulligan turned heads in a sweeping monochrome floral dress by Vionnet. She described the experience of being nominated as "like being punched — nicely." Prince William, wearing a traditional Saville Row suit, received huge cheers and stopped to chat with waiting fans and have his picture snapped outside the opera house. William presented a lifetime achievement award to Redgrave, and also was announced as the new president of the British Academy of Film and Television Arts, which presents the awards — a role once held by his grandfather, Prince Philip. "Fish Tank," Andrea Arnold's drama about a feisty London teenager, was named best British film. The award for best animated feature went to Pixar's soaring 3D adventure "Up," and Jacques Audiard's prison thriller "A Prophet" was named best foreign-language film. "Twilight" actress Kristen Stewart won the rising star award, decided by the public. Stewart was cheered loudly by hundreds of film fans when she arrived at the opera house — but even she admitted to being star-struck. "I'm sitting right behind Kate Winslet, and every time she turns around I wish I didn't exist," Stewart said. "I love her."